The story of the White Rose and Resistance to Hitler! The White Rose (weisserose), named after a Spanish novel (Rosa Blanco). The Group coordinated efforts on Campus for Civil Rights and Opposition to Nazi policies. Among their efforts on campus were weekly discussion groups, painting 'freedom' on brick walls at the entrance into campus, and distributing leaflets opposing the Reich on moral and political grounds, encouraging students to think for themselves. 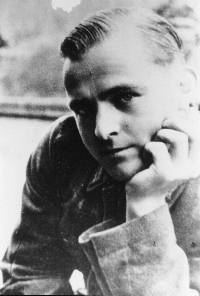 In the early summer of 1942, a group of young men — including Willi Graf, Christoph Probst and Hans Schol formed a a non-violent resistance group in Nazi Germany, consisting of a number of students from the University of Munich and their philosophy professor. The group became known for an anonymous leaflet campaign, lasting from June 1942 until February 1943, that called for active opposition to the Nazis regime. The group co-authored six anti-Nazi Third Reich political resistance leaflets. Calling themselves the White Rose, they instructed Germans to passively resist the Nazis. They had been horrified by the behavior of the Germans on the Eastern Front where they had witnessed a group of naked Jews being shot in a pit. The core of the White Rose consisted of five students — Sophie Scholl, her brother Hans Scholl, Alex Schmorell, Willi Graf, and Christoph Probst, all in their early twenties — also members were Hans and Sophie's sister Inge Scholl, and a professor of philosophy, Kurt Huber. Between June 1942 and February 1943, they prepared and distributed six different leaflets, in which they called for the active opposition of the German people to Nazi oppression and tyranny. Huber drafted the final two leaflets. 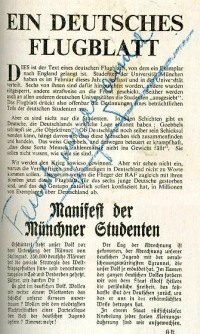 A draft of a seventh leaflet, written by Christoph Probst, was found in the possession of Hans Scholl at the time of his arrest by the Gestapo, who destroyed it. The White Rose was influenced by the German Youth Movement, of which Christoph Probst was a member. Hans Scholl was a member of the Hitler Youth until 1936 and Sophie was a member of the Bund Deutscher Mädel. The ideas of d.j.1.11 had strong influence on Hans Scholl and his brothers and sisters. d.j.1.11 was a youth group of the German Youth Movement, founded by Eberhard Koebel in 1929. Willi Graf was a member of Neudeutschland and the Grauer Orden. Neudeutschland is a catholic youth association. The group's members were motivated by their Christian beliefs. They had witnessed the atrocities of the war, both on the battlefield and against the civilian population in the East, and sensed that the reversal of fortune that the Wehrmacht suffered at Stalingrad would eventually lead to Germany's defeat. They rejected fascism and militarism and believed in a federated Europe that adhered to principles of tolerance and justice. During early summer of 1942, Alex Schmorell and Hans Scholl wrote four leaflets, copied them on a typewriter with as many copies as could be made, probably not exceeding 100, and distributed them throughout Germany. These leaflets were left in telephone books in public phone booths, mailed to professors and students, and taken by courier to other universities for distribution. All four were written in a relatively brief period, between June 27 and July 12. 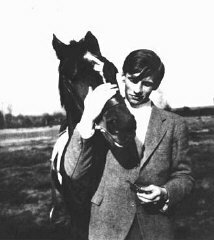 As far as is known today, Hans Scholl wrote the first and fourth leaflets, Alex Schmorell participated with the second and third. All leaflets were also sent to the members of the White Rose, in order that we could check whether they were intercepted. Significantly, of the first 100 leaflets, 35 were turned over to the Gestapo. By turning the leaflets over to the secret police one hoped to be beyond suspicion. It might even have entered one's mind - and it certainly would not have been unthinkable - that such leaflets could have actually been produced and mailed by the Gestapo in order to test one's loyalty to the party and state. Producing and distributing such leaflets sounds simple from today's perspective, but, in reality, it was not only very difficult but even dangerous. Paper was scarce, as were envelopes. And if one bought them in large quantities, or for that matter, more than just a few postage stamps (in any larger numbers), one would (have) become instantly suspect. Leni Riefenstahl and the Holocaust!